tomorrow is our first day of Winter. Boy the year is flying away so very fast. 3D Card Embroidery Pattern Sheet 13 "Bluebirds". Threads are Mettler Polysheen 1332, 1551, 3652, 3711. Leanne Creatief corners compliment the card. Stickers and pearls have also been added. I am going to start on my Christmas cards early this year so I won't be running late. Don't forget to take a look at Ann's Paper Art webshop, I am sure that you will find something to inspire you. 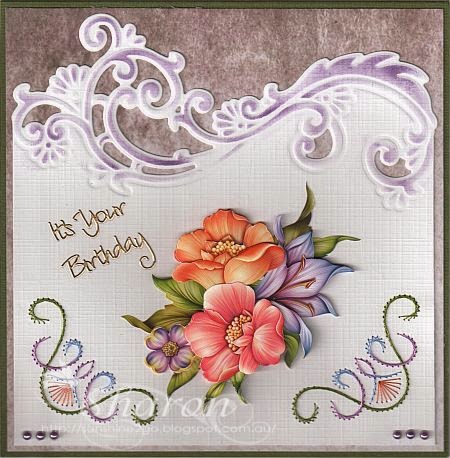 A beautiful birthday card created with one of my favourite patterns by Ann's Paper Art. 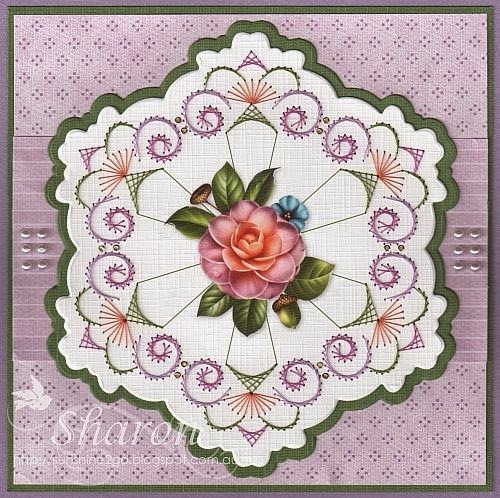 Ann created this pattern especially for the Nellie Snellen Stain Glass Die SGD001. 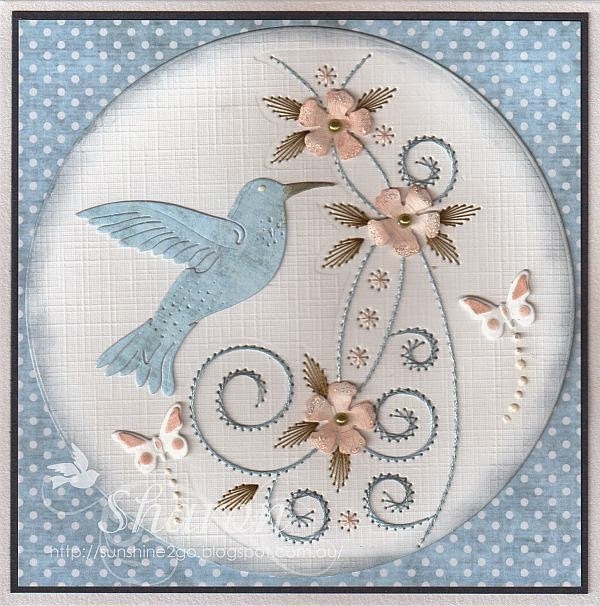 The pattern and die combined with the beautiful 3d Embroidery Sheet #10 called Camilla are available from Ann's Paper Art as a complete set. Threads are Mettler Polysheen 114, 2912, 3034, 5833. Background paper is from Lili of the Valley called "Promises"
I love creating cards with this die and pattern as it can be used for many occasions. This month my friendship card was created for Katrin, she lives in Germany. I decided to use my stitching stencil by Ann's Paper Art, AND002 what a wonderful way to create a quick card as all I needed to do was run it through my big shot! don't worry it will go through all machines. Threads are Mettler Polysheen, 1761, 3853, 3951, 6133.
it is worth buying if you find one. The flowers are coloured with "Tattered Rose" distress ink. I added some glitter around the edge. The Hummingbird is by Cheery Lynn, I added "Frayed Burlap"distress ink on the beak.. The butterfly is from my stash. Pearls and Cosmic Shimmer "Vanilla" have also been added to the card. Background card is by Lili of the Valley paper pad called "Bear Necessities". I really did have a lot of fun creating this beautiful card and I hope that you also like it. This week was our daughters birthday and this is the card that I created for her. Threads are Mettler Polysheen, 0504, 3650, 3853, 3951. I die cut the gold bow and ribbon again and adhered it cupcake. 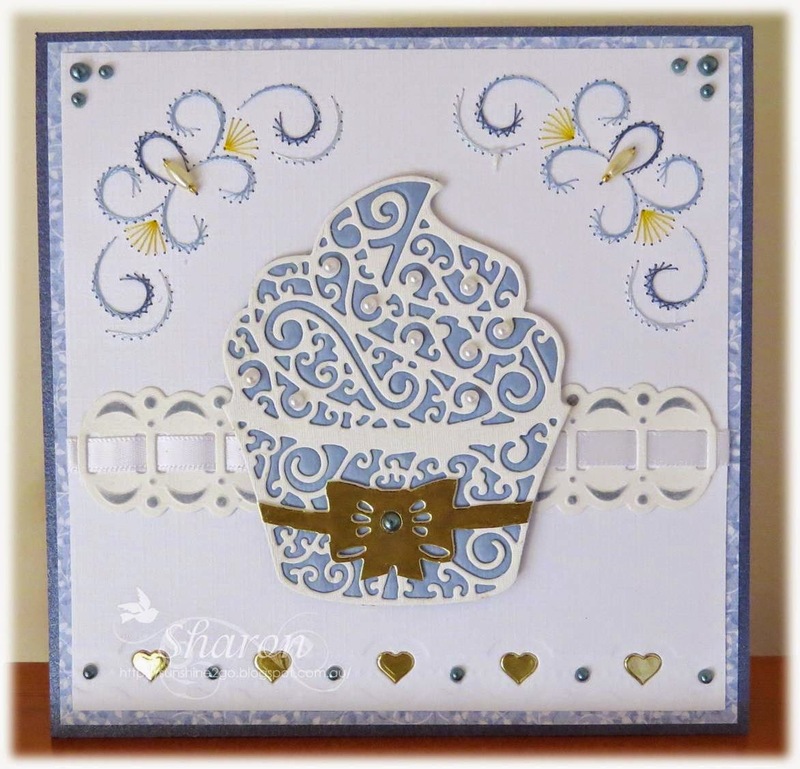 Behind the cupcake I used a ribbon die by Marianne Design LR0101. Along the bottom I added hearts with the help of Spellbinders "Mix & Match" E8-002. Distress ink, beads, pearls and ribbon have also been added. I enjoyed creating this card for our daughters special day. Last week it was Petra's birthday and this is the card that I created especially for her. a small portion of the pattern. Threads are Mettler Polysheen 1114, 2830, 3331, 5833.
which I coloured with Tim Holtz distress ink "Chipped Sapphire". 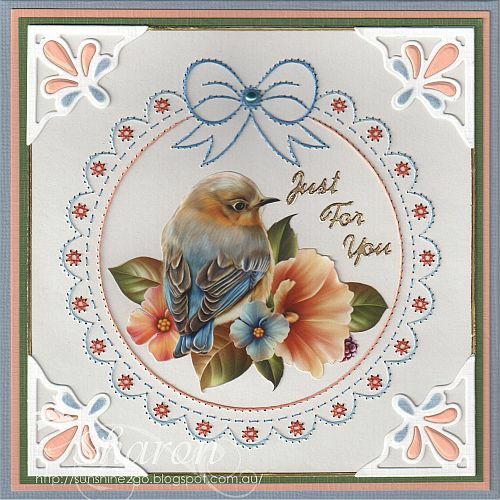 The decoupage is from 3D Card Embroidery Pattern Sheet 14 "Blue Lily"
The background paper is by Joy! Pearls and stickers have also been added. I enjoyed creating this card and I do hope that Petra had a wonderful birthday. Thank-you for coming by and having a look at my new creation. 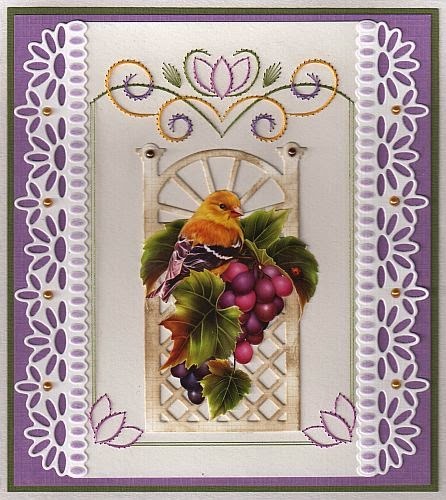 3D Card Embroidery Pattern Sheet 12 Grapevine. Threads are Mettler Polysheen 0700, 2721, 2905, 5833.
and added Tim Holtz "Frayed Burlap"and some pearls to give it a aged looked. Along the edge of the card I have added a beautiful die by Joy! 6002/0100. in their collection of dies. I added Tim Holtz "Dusty Concord"and some pearls to the Joy! die. I do enjoy creating cards with the Stitch a Card- pre pricked toppers. They are especially great for those people that don't have the time to prick a card.